“The Glenlivet Cipher is a mystery. All your senses will be tested, as you decode its secret tasting notes. You may even have the makings of a master distiller,” said Alan Winchester, Master Distiller of The Glenlivet. I had the opportunity to be there at the secretive Skullduggery, to witness the unveiling of this exquisite Glenlivet Cipher with other Glenlivet Guardians. Released with no cask information, tasting notes, nor age statement, The Glenlivet Cipher challenges whisky enthusiasts to use all their senses to decode the flavour profile of this mysterious single malt. Ushered into a room blindfolded, we were presented with the various flavour profiles, exciting times. 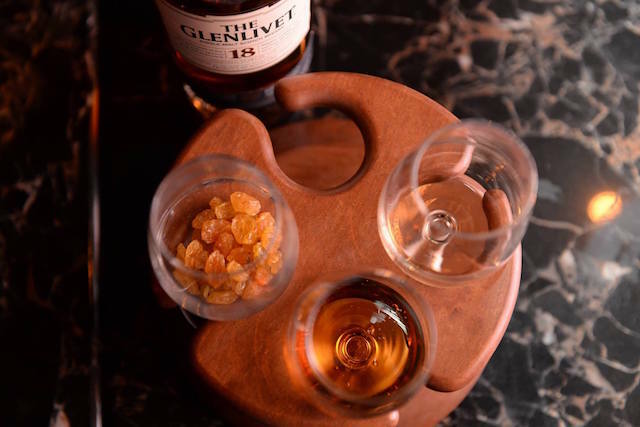 “The Guardians of The Glenlivet will be the very first people to taste the Cipher in Malaysia,” said Brand Manager Benedict Yong of Pernod Ricard Malaysia. “It is one of the privileges of being one of The Guardians. We also made it a challenge right from the beginning as a tribute to this unique limited edition single malt. 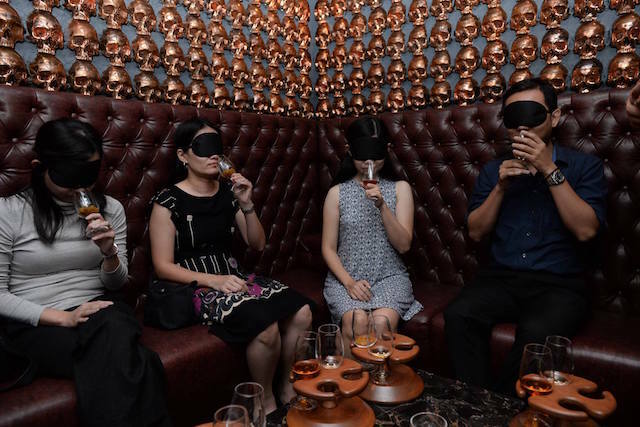 Immediately upon entry, guests were then taken in groups through a sensory game, while blindfolded, to decipher certain aroma elements that were representative of The Glenlivet Cipher. Winners of the game got to take home some small prizes at the end of the evening. The Glenlivet Cipher retails for RM780 per bottle, inclusive 6% GST. As this is a limited edition whisky, the Cipher will first be made available to The Glenlivet Guardians, before being released for retail purchase at selected outlets. The rise in popularity of single malt whiskies over the past 10 years is an indication that more people are actively nosing, tasting, and discussing single malt whisky. The Cipher will encourage whisky enthusiasts to sharpen the use of their senses and have a deeper appreciation of the whisky’s complex flavour profiles. Those interested can head to The Glenlivet Cipher microsite to test their nose and palate at https://cipher.theglenlivet.com. There, a video with clues to help decode the whisky will be provided. They will then have to select six aromas for the nose and six flavours for the palate, thus creating the flavour wheel out of over 10,000 possible combinations. On completion, a percentage score will reveal how close they have come to cracking The Glenlivet Cipher taste profile. Their score can be shared on social media, and the challenge can be repeated as many times as they want. 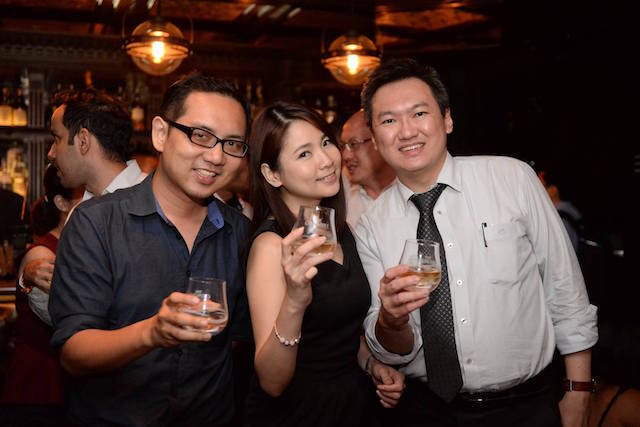 Guardians in Malaysia and is currently one of the country’s most active whisky communities. To be a Guardian, do email them at theguardians@millennium.net.my. For more information, check out The Glenlivet Malaysia Facebook Page at https://www.facebook.com/TheGlenlivetMY. My hubby loves to drink whisky. Shall ask him to go for the test. As a non-drinker, I would totally fail this test. However, being blindfolded to taste something is never my forte, even when it comes to other beverages or food. Gosh, something really fancy. Its pretty cool that you got to taste it while youre blindfolded. the bottle is uniqueand love to see you guy decode the wording.